You're going to need a huge bowl and lots of milk for Malt-O-Meal's annual fundraiser for United Way. The venerable Minnesota company will be selling 25,000 bags of its cereal for only $1 each. 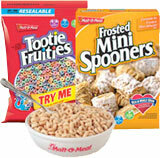 That's up to 75 percent off the normal price, depending on where you buy your Marshmallow Mateys, Tootie Fruities and other tasty knock-offs of other brands. But set your alarm early. The cash-only sale starts at 7:30 a.m. Thursday in the Crystal Court of the IDS Center in downtown Minneapolis. And you'll want to get there first thing, even though there is a 10-bag limit per person: The supply usually lasts until about noon, but by then you just know that all that will be left is Raisin Bran, and who wants 10 bags of that? Incidentally, all of the proceeds go to United Way. On top of that, Malt-O-Meal matches each dollar, for a total donation of $50,000. That's "incredible given the economic times," a United Way spokeswoman said. Yes, it is. Buyers line up to buy Malt-O-Meal cereal at a previous $1 sale.